Though originally caught wild along the southern coasts of Australia, commercial stocks were damaged by over-exploitation and Mussels sold today are all farmed. The commercial species in Australia is Blue Mussel, while Green Mussels are imported from NZ. Import regulations mean that Green Mussels have been frozen and will be dead, while local mussels are sold live and whole in the shell. They are available year round from aquaculture in NSW, VIC, SA, Southern WA and Tasmania. To farm, immature mussels are suspended on long ropes attached to buoys in clean bays and left to feed and grow. As filter feeders, healthy mussel populations are indicative of clean water supplies. MUSSELS are juicy and have a great 'sea flavour'. The edible portion is the muscle within the shell and it take very little time to cook. As soon as they open, remove from the heat to prevent the meat from shrivelling and becoming tough and chewy. Steam or simmer in the shell with wine, stock and aromatics. Mussels can also be Grilled or BBQ'd in the shell, which gives a slightly smoky taste. To smoke, marinate, pickle or crumb and fry, remove mussels from the shell first. Mussels and their liquor make a great addition to soups, curries, stews or chowders. The idea that a mussel that doesn't open should be discarded is myth. Simply prise open the shell to get to the meat - if it has gone bad you will be able to smell it distinctly. If steaming or poaching, let the mussels cook in their own juice to retain natural flavours. 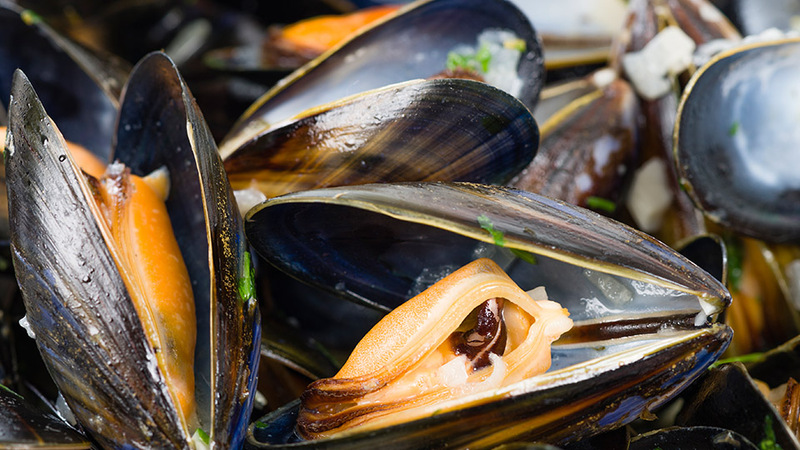 Avoid using too much liquid as the natural liquor of the mussels and moisture from the steam may be adequate. An excellent choice of cooking liquid can be made using a brunoise of tomato, onion, garlic, chilli, lemon juice and white wine. Farming methods for Mussels have very little impact on surrounding ecosystems, and can in fact be beneficial to marine environments.